Japanese Tea Story : English Breakfast Udon Noodle!? I would say that the meal including eggs, bacon, sausages, mushroom, tomatoes, baked beans and some toasts…with a pot of tea with milk, of course!. 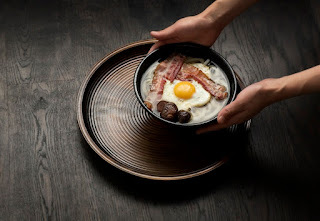 I heard that a restaurant in London named “KOYA bar” offers their signature menu, “English breakfast Udon noodle”. I visited London this past May, but I didn’t know this and missed it. I’m not sure whether I had tried even if I had known it. But I believe green tea would be better for this breakfast. Memory of the UK ! ?